How many of you have at least a few old cell phones lying around your house, collecting dust, stuffed in a drawer, forgotten until Spring cleaning? Just think about it: your old phone is a powerful machine unto itself, one someone a hundred years ago would have traded their house and land for, and it’s just lying around not doing anything. Jay Reece Prepaid, a leader in cell phone prepaid plans and cell phone repairs in Hagerstown, offers up ideas to put your old cell phone to good use. Keep your old cell phone as a backup phone. A good majority of cell phone purchasers do not buy the optional cell phone warranty that covers things such as broken phones or phones accidentally getting submerged in water. If you’re one of those people (or even if you’re not), it’s a good idea to have an old cell phone around in case your’s gets broken. New cell phones are expensive and replacing one every time it breaks can get expensive. The best baby distraction toy. Old cell phones are amazing to babies. With all the buttons to press, pictures to take, and the cool noises and sounds that come out of cell phones, you have one amazing toy for your baby or child. For older kids, old cell phones can store thousands of songs, videos, movies, podcasts, and games. You can even download and save movies from Amazon and Netflix, and music from iTunes. You just have to make sure your child doesn’t accidentally dial 911 since all old cell phones still retain emergency calling functions. The best baby monitor. Speaking of babies, with the top-of-the-line cameras now in cell phones, you can turn your old cell phone into a great baby monitoring tool. All you need is an app, and most will allow you to do both audio and video monitoring. Some apps will allow for two-way communication, so you can talk to your baby from afar. All-in-one nighttime device. Once the chaos of your day is done, one of the best things about life is retiring to your bedroom and your bed to wind down for the night. You’ll need to set your alarm for the next morning, get your white noise machine going and/or soft music, and prepare your soothing music to fall asleep to. Also, you’ll need your eReader to wind down with your favorite novel before bed. And you guessed it — your old cell phone is the perfect tool to do all of these things without ever having to leave your bedside. Home security. Many cell phone cameras are now often better than older, stand-alone cameras. Through the help of an app, you can set up your old cell phone as a security camera for your home or office. Many apps offer live video-streaming and even motion-detection capabilities to ensure your home is safe and secure while you’re away. A virtual reality headset. You can turn your old cell phone into a VR headset. All you’ll need is either VR goggles or headset compatible with your cell phone model and an app. For added functionality, look for a headset that comes with a Bluetooth gamepad, which will allow you to better control games and access the menus. With Smartphones having been around for almost a decade and new phones with increased functionality coming out every year, you probably have at least one old cell phone in your home. 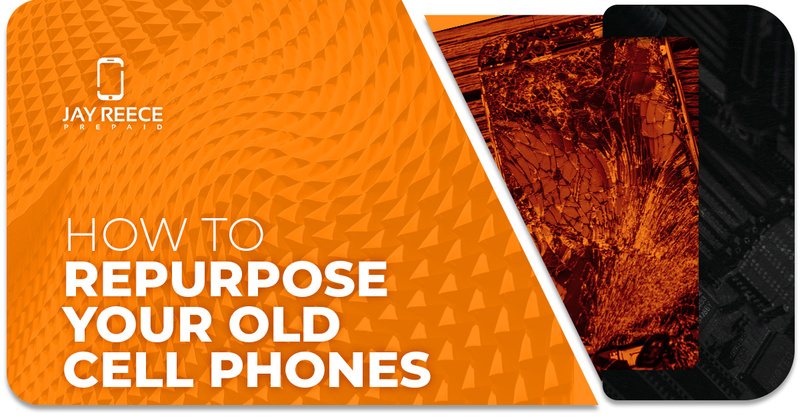 Jay Reece Prepaid suggests the above uses for your old cell phone, but there are dozens more. There are wonderful charities that are in need of old cell phones as well. Just be sure before you donate your old cell phone to delete all of your personal information and files ahead of time. 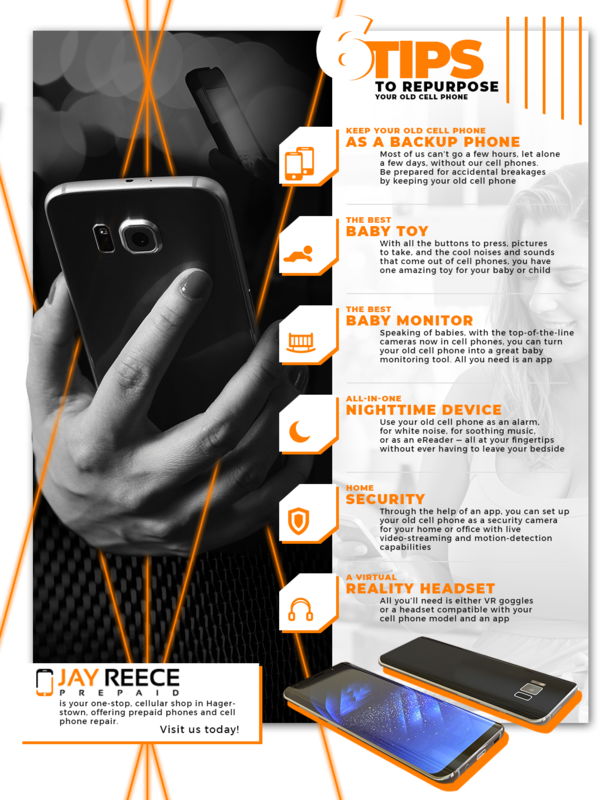 Jay Reece Prepaid specializes in lightning-quick cell phone repair and amazing prepaid cell phone plans that have no contracts. As a family-owned and operated local business in Hagerstown, Jay Reece Prepaid puts the customers’ needs first. We understand how necessary your cell phone is to your daily life, from planning your day to checking in on your kids at school. We do our utmost to deliver timely service at affordable prices, so you can be on your way. Contact us today to get started! ©2019 Jay Reece Prepaid - Do not copy. All rights reserved.